Shetland names are included in brackets. 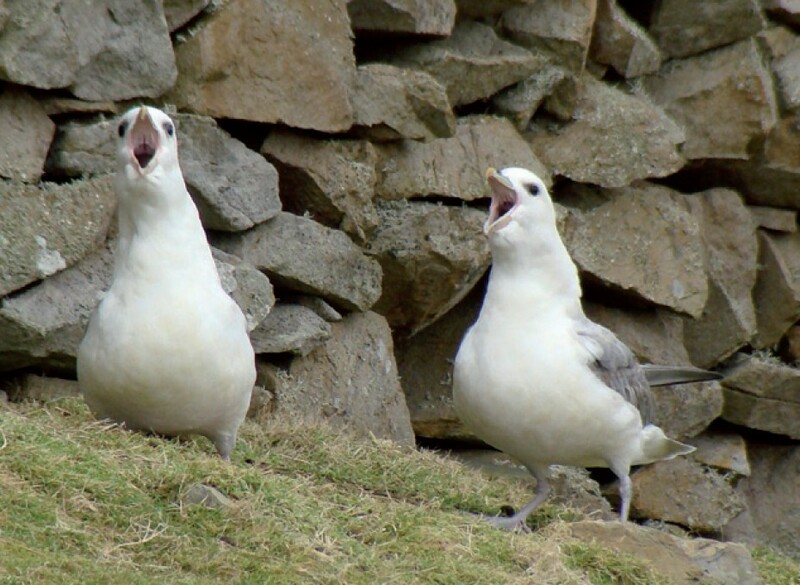 It seems difficult to believe that there were no Fulmars breeding on Fair Isle before 1903, when the species spread from its British outpost of St Kilda (or possibly from the Faroe Islands or Iceland) and colonised the south of Shetland. 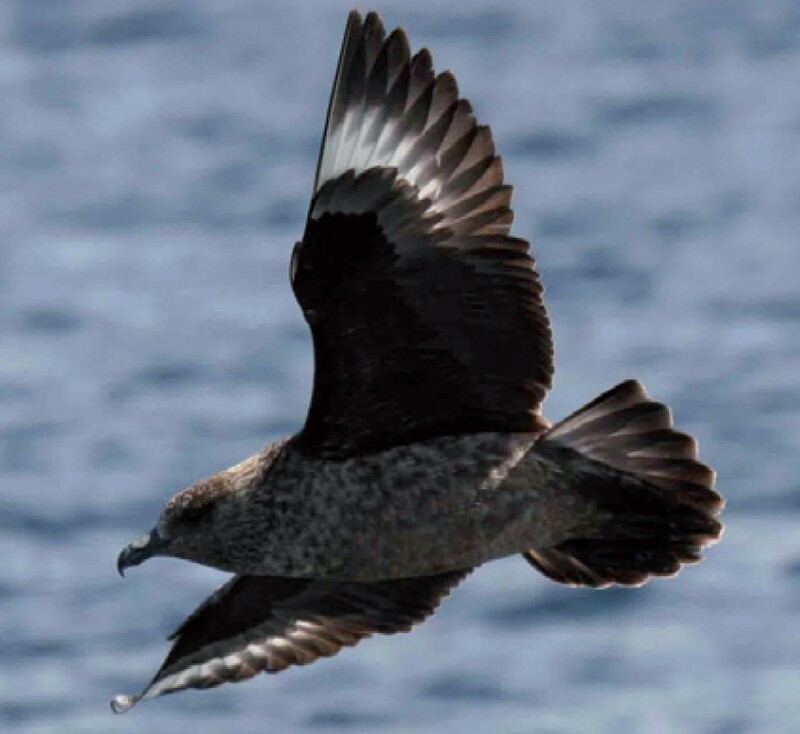 As a scavenger of the seas with a varied diet, the Fulmar was able to take advantage of whaling and fishing fleets to increase its distribution, which now includes the North Atlantic and North Pacific. 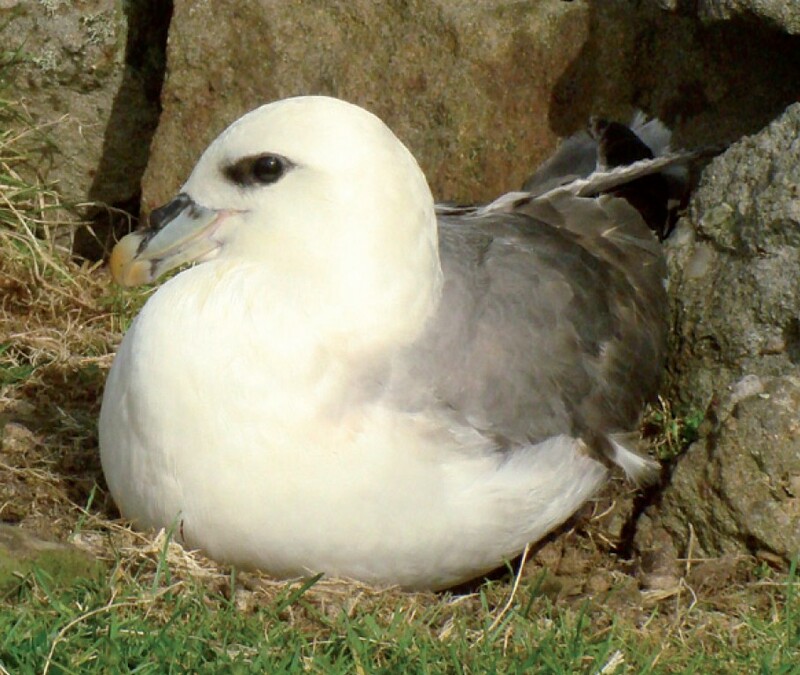 In recent years, the success story of the Fulmar has taken a step backward with numbers decreasing throughout Britain and Ireland. On Fair Isle, the population peaked at over 43,000 pairs in 1996, but was down to 32,061 pairs in 2016. The Fulmar’s habit of scavenging scraps, plankton and fish from near the surface has led to an increasing amount of plastic being ingested by the birds. Studies in the North Sea showed that Fulmars have an average of around 30 pieces of plastic per bird in their stomachs (that’s the equivalent of about 60 grams of plastic in a human stomach). Despite being able to live to well over 40 years, many are starving to death at a much younger age, with the plastic being carried in their stomachs possibly contributing to this. 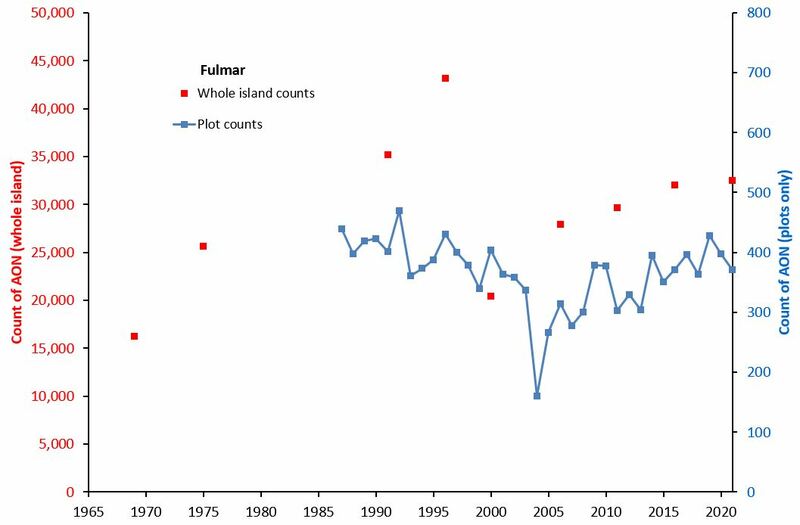 Whole island and plot counts of Fulmars on Fair Isle, 1969-2018. 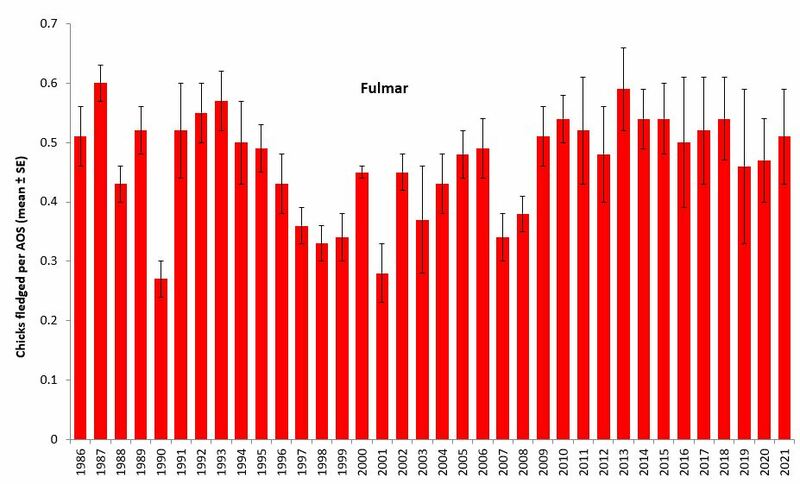 Breeding success of Fulmars on Fair Isle (means from 5 plots), 1986-2018. 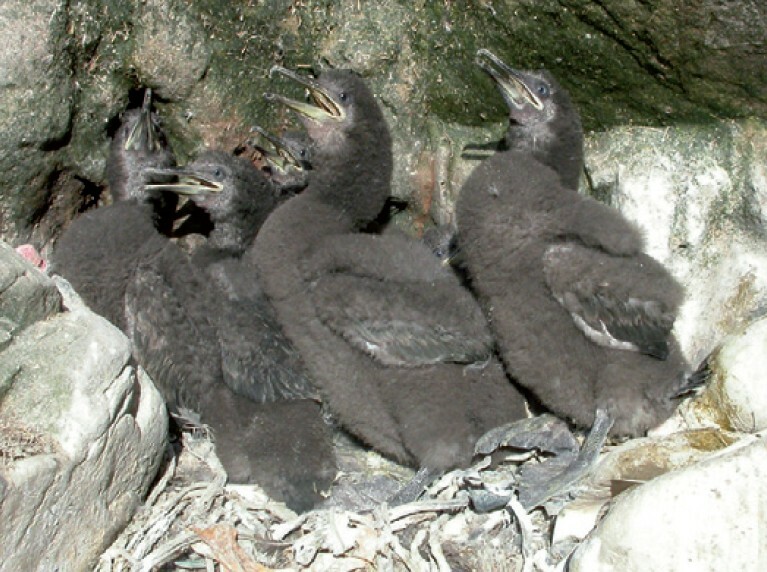 The Shag’s distribution stretches around the Atlantic coasts of Europe and the Mediterranean. The European population of around 70,000 pairs is in decline across most of that range and this is reflected on Fair Isle, where the population has decreased from a high of over 1,500 pairs in the 1960s to just 204 pairs in 2013. Sandeels comprise a large part of the diet and it is a shortage of food in the breeding season that is likely to have caused the decline. The number of young produced in recent years has been very low, with starvation being the primary cause of chick mortality. 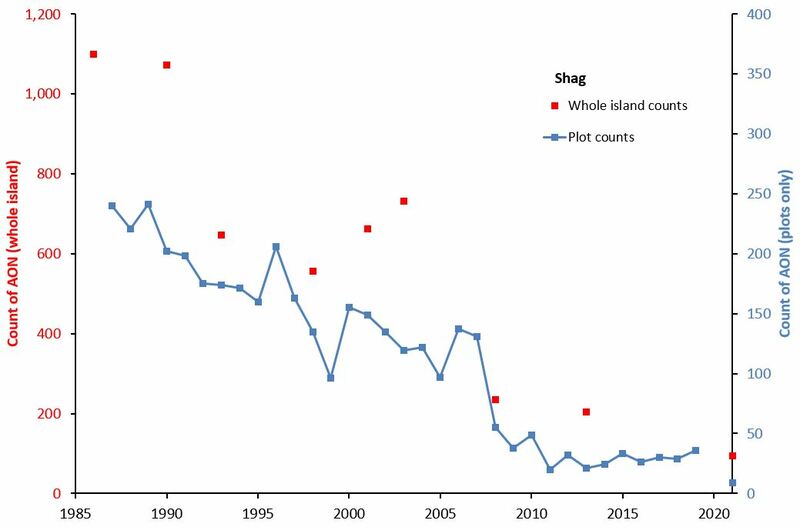 Whole island and plot counts of Shags on Fair Isle, 1987-2018. 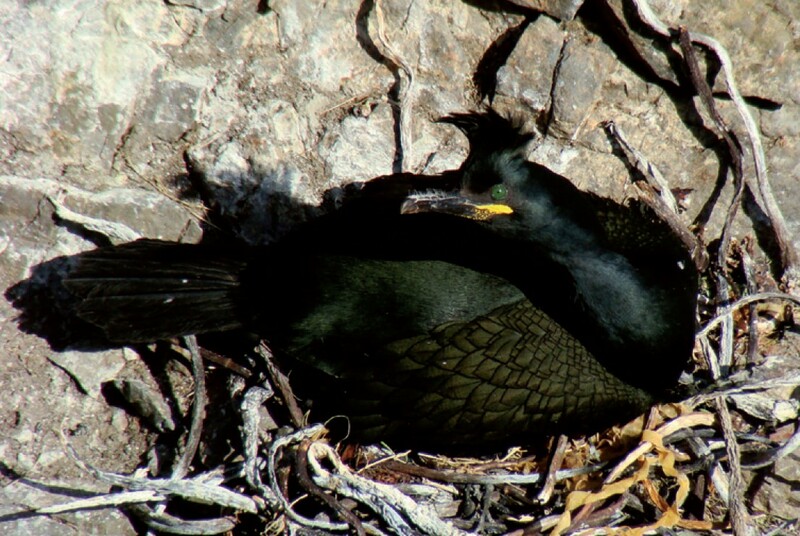 Breeding success of Shags on Fair Isle, 1986-2018 (sample size of monitored nests has ranged between 12 and 95). 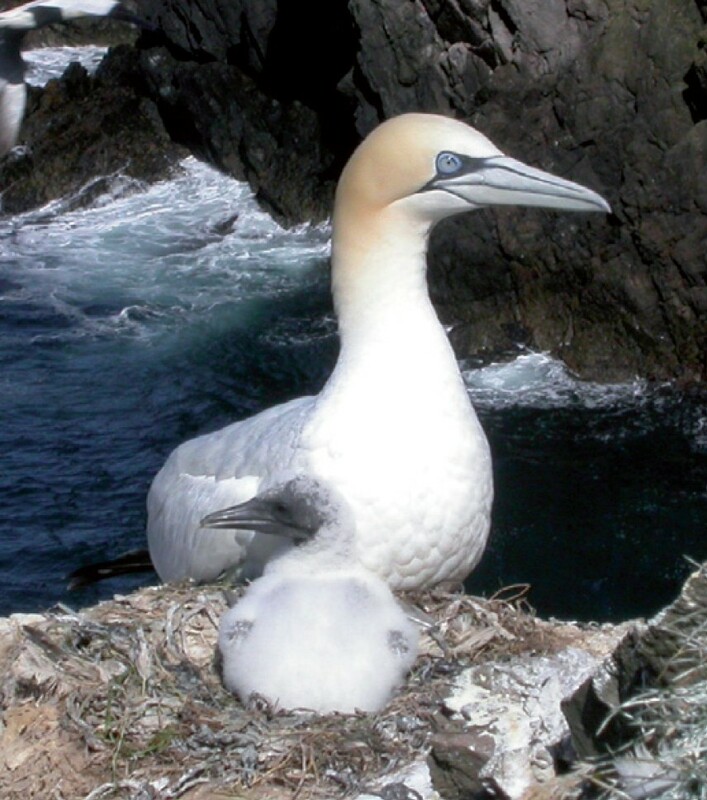 There are thought to be about 390,000 pairs of Gannets in the world, with around half of these nesting in Scotland. The rest breed in other British and Irish colonies, in Iceland, Norway and northern France with almost 78,000 pairs in Canada. Although they have always been a common visitor to the waters around Fair Isle, breeding did not take place on the island until 1975. Numbers have increased steadily since then and just over 4,000 pairs were recorded in 2011. This reflects a general increase in numbers in Britain and Ireland, with the Gannet’s ability to cover huge distances on feeding trips and take a large range of fish, thought to be driving the population growth (in contrast to other seabird species that are particularly dependant on sandeels or sprats). Recent counts suggest a levelling off or slight decline in numbers, with 3,409 pairs in 2016. Three months of being stuffed with mackerel and other fish leaves the young Gannet almost too heavy to fly and, in an unusual start to life away from the nest, the chick plunges to the sea where it may have to swim for a few days before it loses enough weight to be able to take to the wing. The amazing plunge-dive feeding technique of the Gannet is self-taught as the young bird makes its way to the coast of Africa to spend its first year in calmer waters. 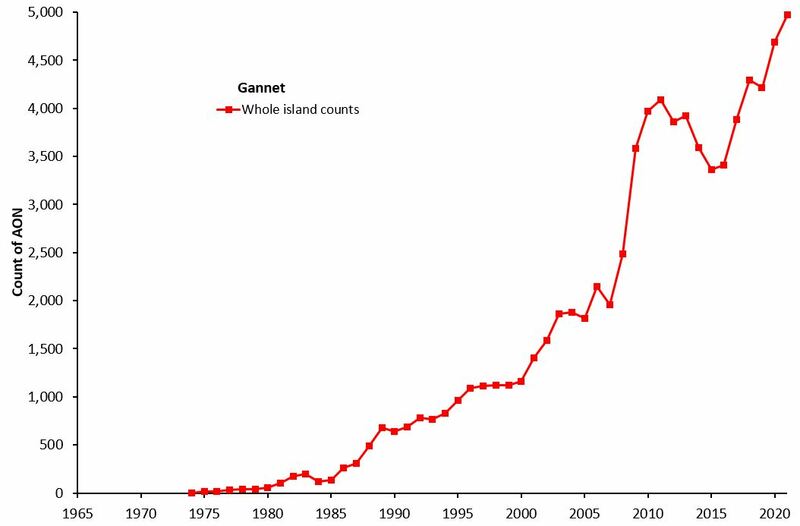 Whole island counts of Gannets on Fair Isle, 1975-2018. 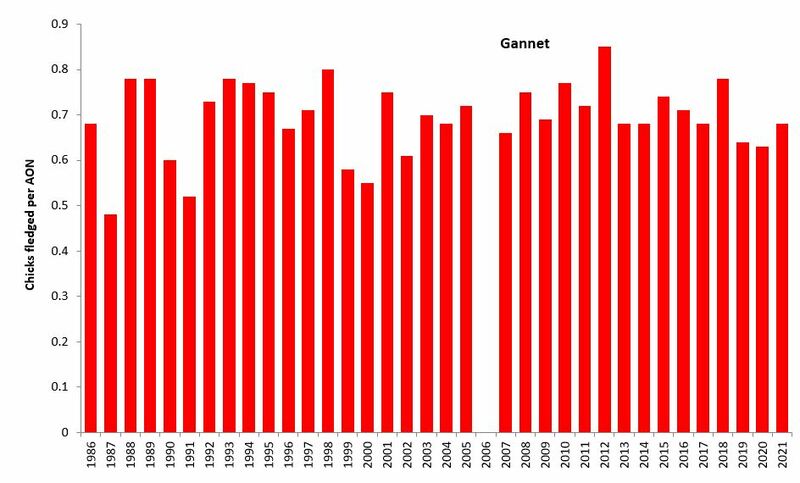 Breeding success of Gannets on Fair Isle, 1986-2018 (sample size of monitored nests has ranged between 107 and 269). Data was not collected in 2006. 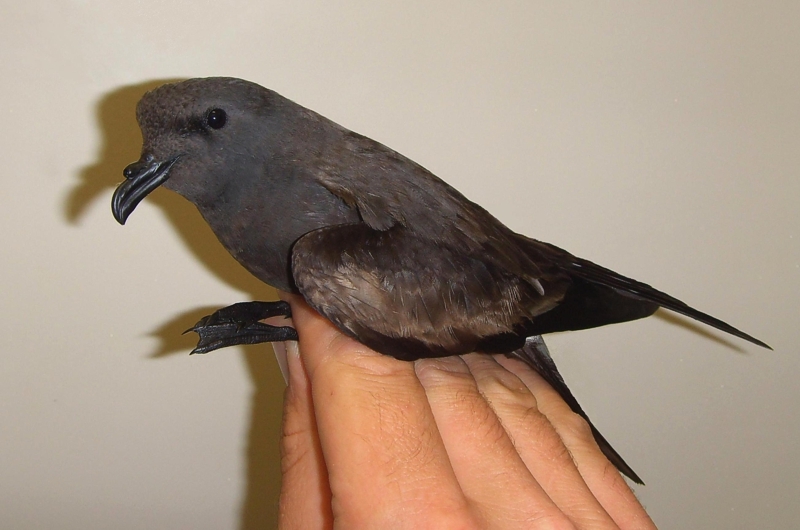 Despite being barely the size of a Swallow, the tiny Storm Petrel lives an amazing pelagic lifestyle. Almost the entire world population of 1.5 million birds is found in Iceland, the Faroe Islands, Britain and Ireland, with smaller populations in various locations as far south as the Mediterranean and Canary Islands. 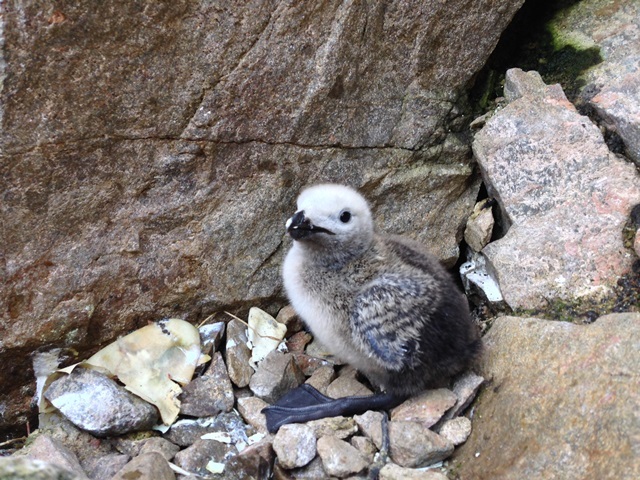 Owing to the risk of predation, they only come back to their nests at night and this, combined with the fact that nests are hidden under rocks and in crevices (some in stone dykes), makes assessing their numbers very difficult. The single, comparatively large egg (which is about 25% of the female’s body weight) is incubated for around seven weeks and the chick takes another ten weeks or so to fledge. 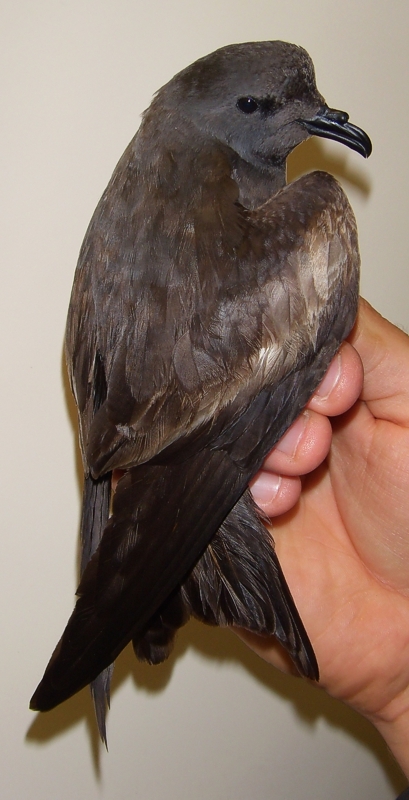 The young Storm Petrels fledge in the autumn and head out to sea and may not return to land for several years. At sea, they feed on a variety of small fish, crustaceans, squid and scraps of offal. Like other burrow-nesting seabirds, Storm Petrels are virtually confined to islands that are free of mammalian predators such as rats and cats, which predate the eggs, chicks and even the adult petrels. 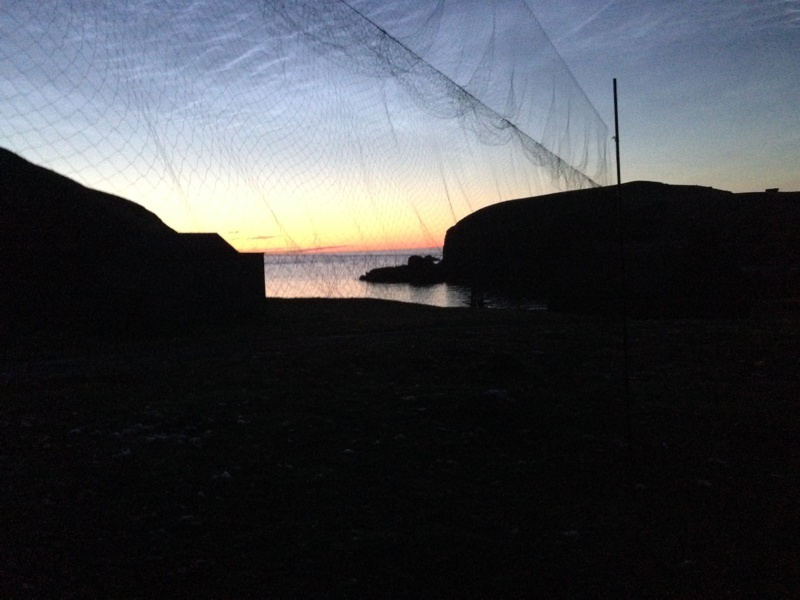 Birds are ringed on Fair Isle from the end of June until early September, with the largest numbers usually caught in late July until mid-August, giving visitors the chance to see this otherwise secretive nocturnal species. 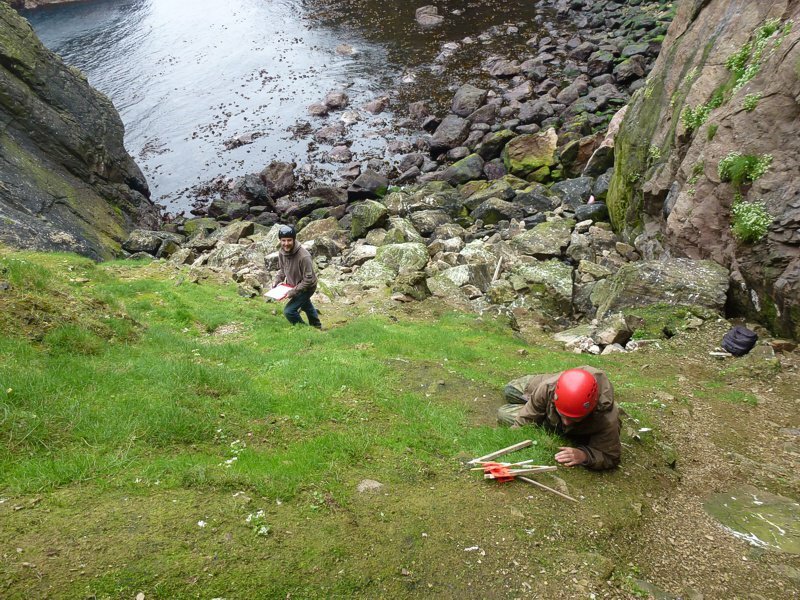 The ringing also provides some fascinating data about the movements of the species, with birds ringed on Fair Isle being recovered as far away as the Indian Ocean coast of South Africa. 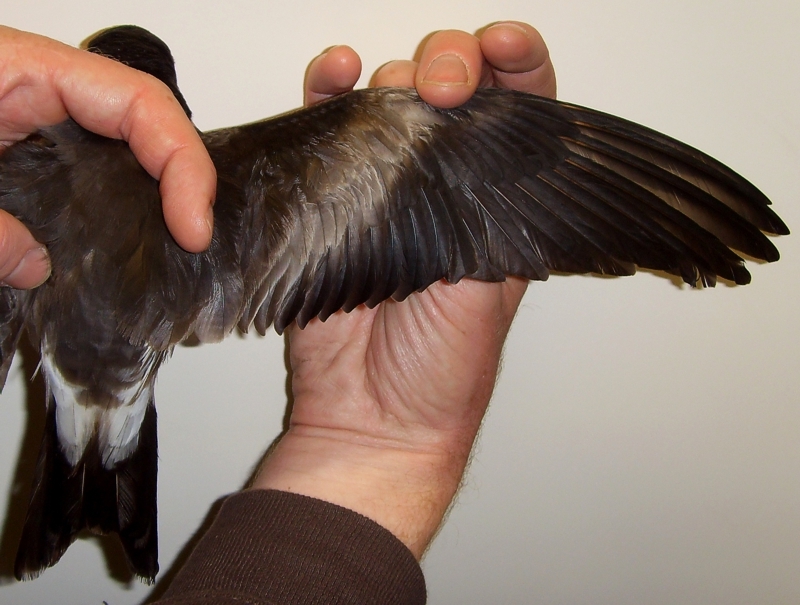 Leach’s Petrel is a highly pelagic seabird, recorded in low numbers on Fair Isle, almost annually. 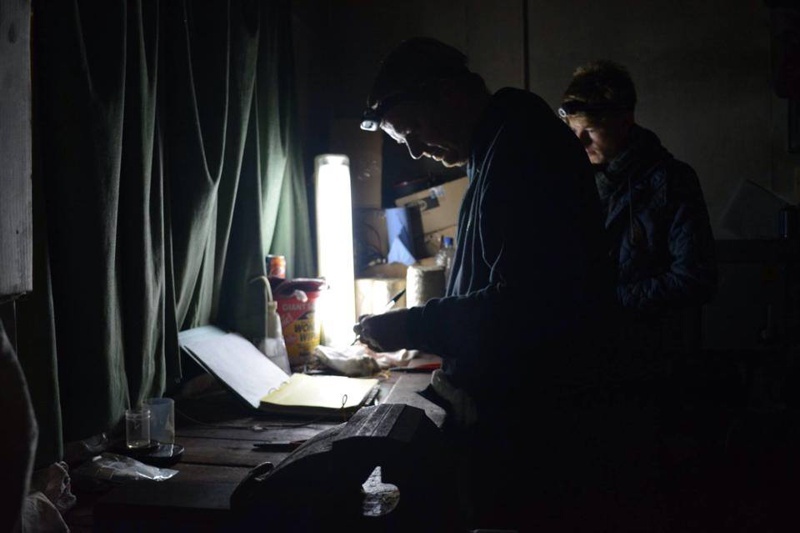 The Observatory’s night-time petrel ringing sessions offer the best chance of encountering the species; a small number of individuals are trapped and ringed during ‘stormie’ sessions in most years. These are thought to be non-breeding birds, prospecting for potential nest sites and attracted in by playback of calls at night. Leach’s Petrels spend much of their lives at sea, wandering the open ocean far offshore. In the UK, the species nests on only a few, very remote islands, for example St Kilda and North Rona in the Outer Hebrides. 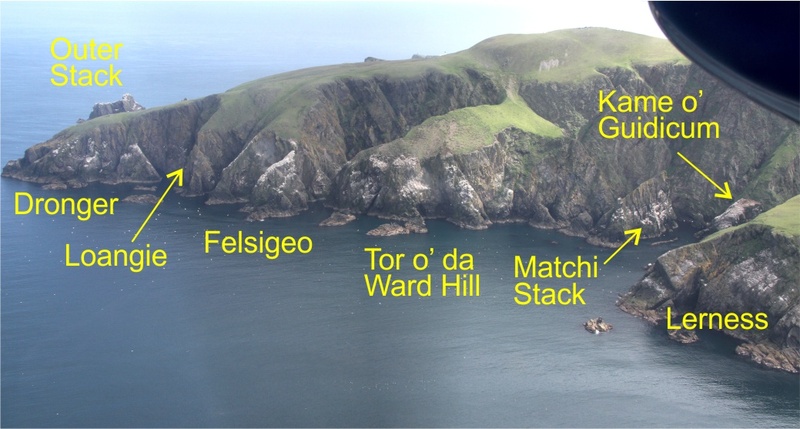 It is not known whether nesting occurs on Fair Isle, but if it does then the most likely locations are perhaps one or more of the small, grassy sea-stacks or, possibly, Sheep Rock. 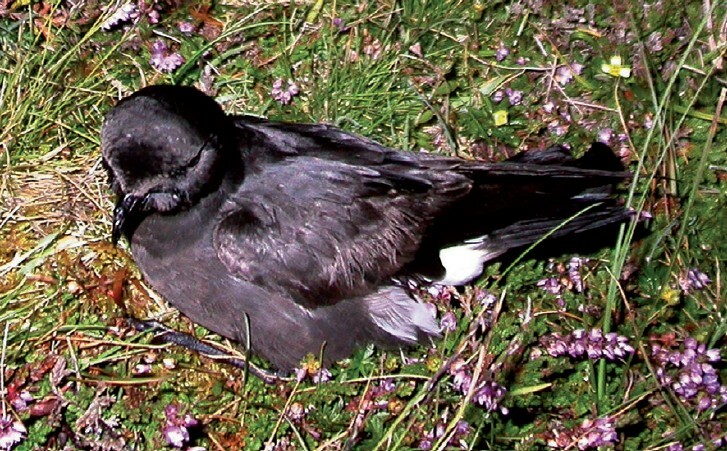 Breeding Leach’s Petrels are extremely sensitive to disturbance from cats; therefore breeding on ‘mainland’ Fair Isle would seem very unlikely. In addition, most breeding sites around the UK are within 70 km of the continental shelf break (200 m isobath), along which the species is thought to often forage. Fair Isle may be just too far away from this offshore marine feature for successful breeding to be feasible. 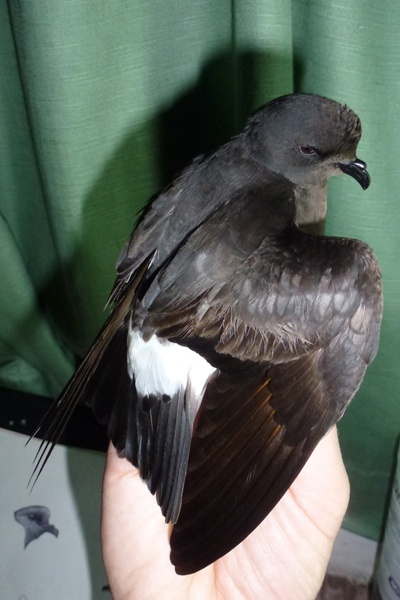 In comparison with Storm Petrel, Leach’s Petrel is slightly larger, has pale grey-brown carpal bars, a V-shaped white rump and a distinctive forked tail. Guillemot has a circumpolar distribution, occurring in northern waters throughout the Atlantic and Pacific Oceans. Britain and Ireland supports around 1.5 million individuals in the summer when they crowd onto cliff ledges in some of the most remarkable colonies in the bird world. Each nesting bird defends a territory of only a few centimetres (about the length of its bill), resulting in a densely packed row of birds that provides some overall protection against predators. 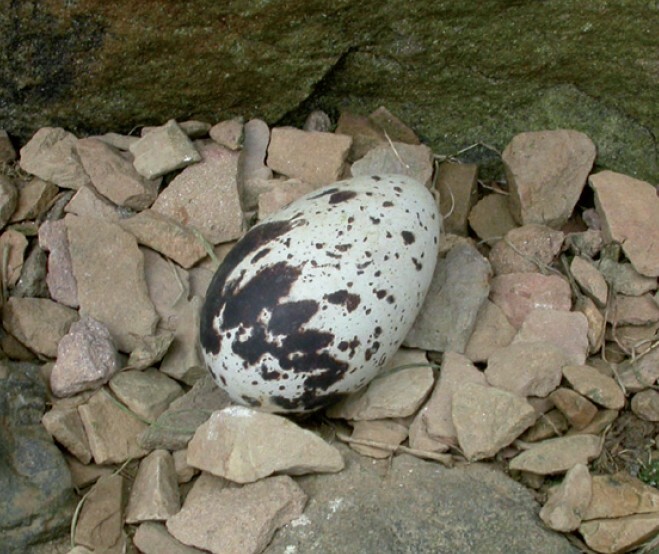 The single egg is laid directly onto bare rock and is thick-shelled and pear-shaped, which helps to prevent it rolling off the ledge. 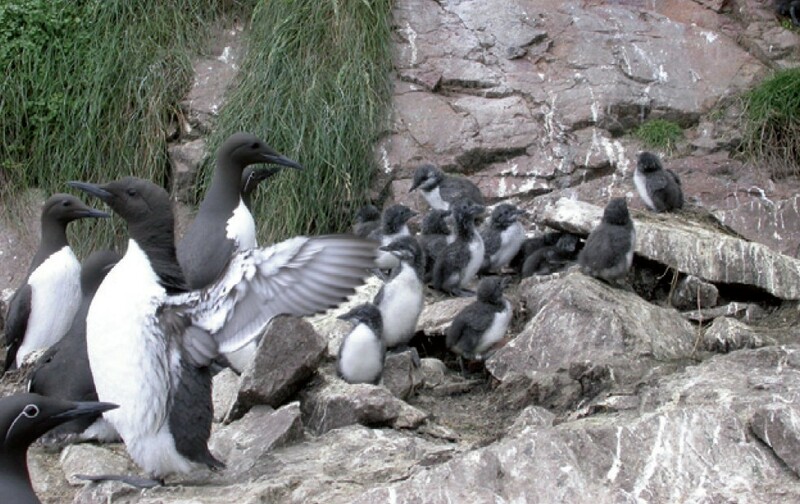 The young Guillemot leaves the nest site when only around three weeks old and still incapable of flight, jumping from the cliff and swimming out to sea to learn to feed with the male parent. 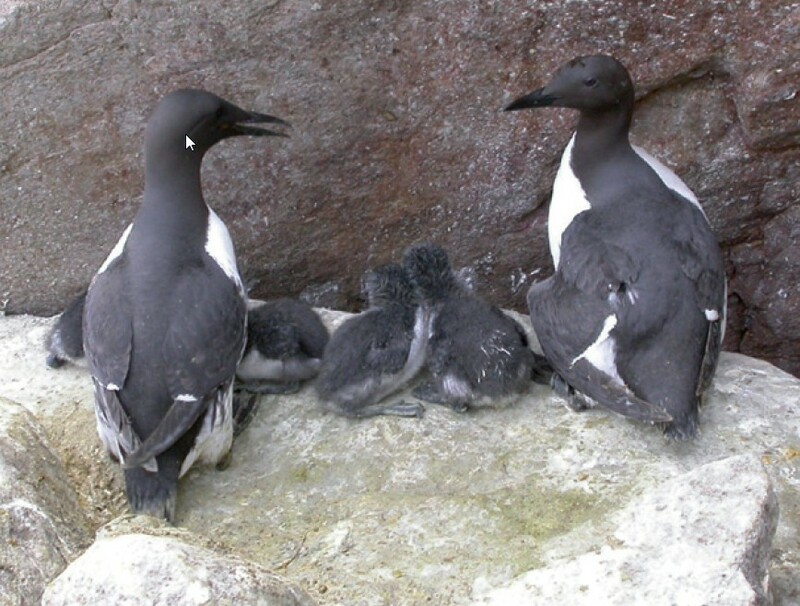 Sandeels, Sprats and other small fish are the main prey items and Guillemots have been recorded at depths of up to 230 metres during feeding dives. On Fair Isle, the population peaked in the late 1990s at over 39,000 birds but this number has since halved and in recent years breeding success has also been poor. 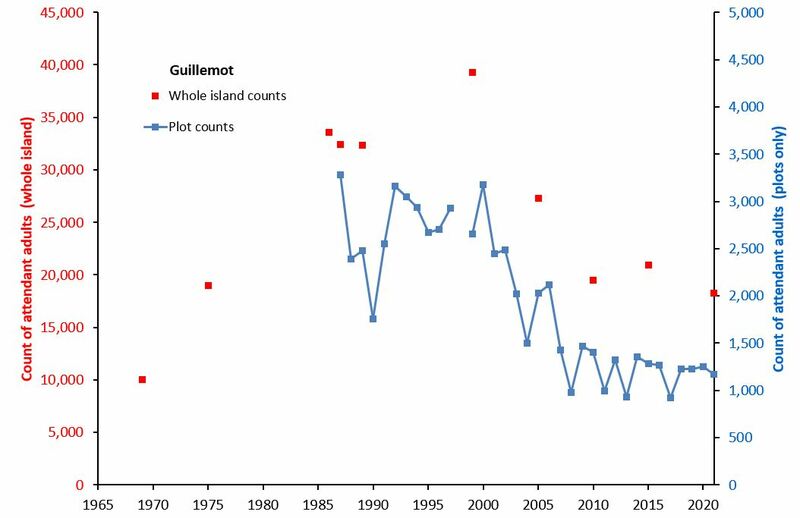 Whole island and plot counts of Guillemots on Fair Isle, 1969-2018. The Razorbill breeds on either side of the Atlantic, with an entire world population thought to consist of around 1.3 million individuals, some 23% of these breeding in Britain and Ireland. 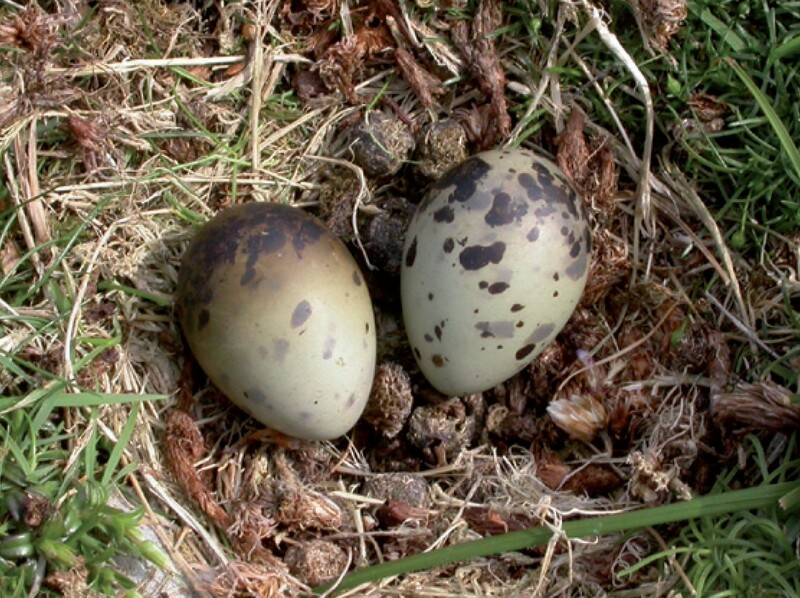 The large single egg is incubated for around five weeks, with the chick leaving the nest two to three weeks later, although it is still dependant on the male parent for several weeks after that. As with many species of seabirds, Razorbills take a number of years to mature and do not breed until they are at least four years old. However, they can be very long lived, the oldest known Razorbill being a 42-year-old bird. Many Razorbills are thought to winter relatively close to their breeding grounds, but several Fair Isle-ringed birds have been recorded making much longer trips in the winter, including a number that have made it as far as Morocco. Sadly, the Fair Isle population has declined in recent years, from a peak in the late 1980s of over 5,000 birds to just 1,930 in 2015. Several recent breeding seasons have seen very poor chick survival, with starvation sometimes resulting in none surviving that year. 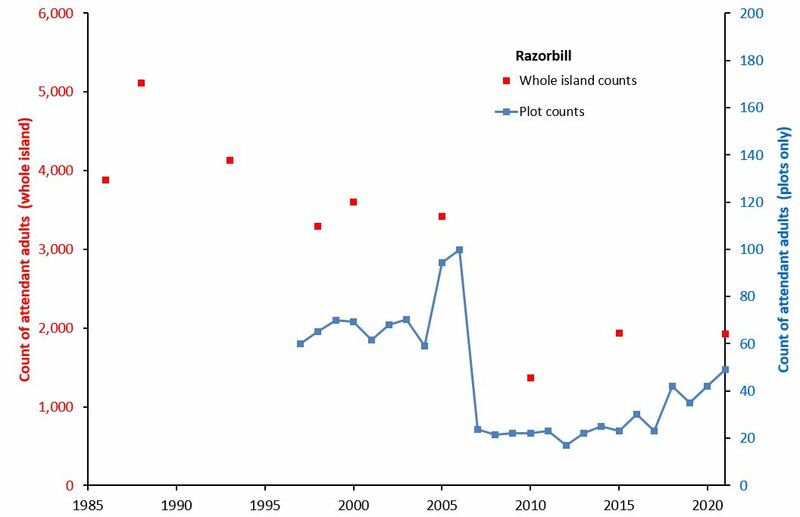 Whole island and plot counts of Razorbills on Fair Isle, 1986-2018. 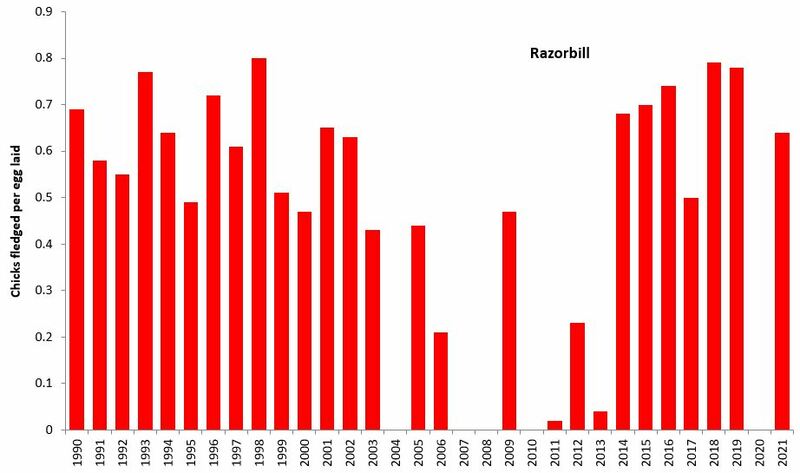 Breeding success of Razorbills on Fair Isle (1 plot), 1990-2018. 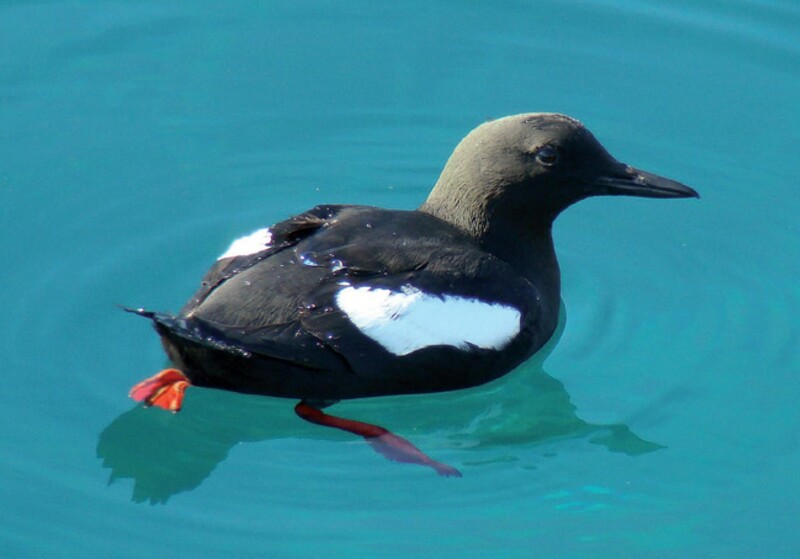 The distinctive Black Guillemot is found in the northern North Atlantic and Arctic Oceans. 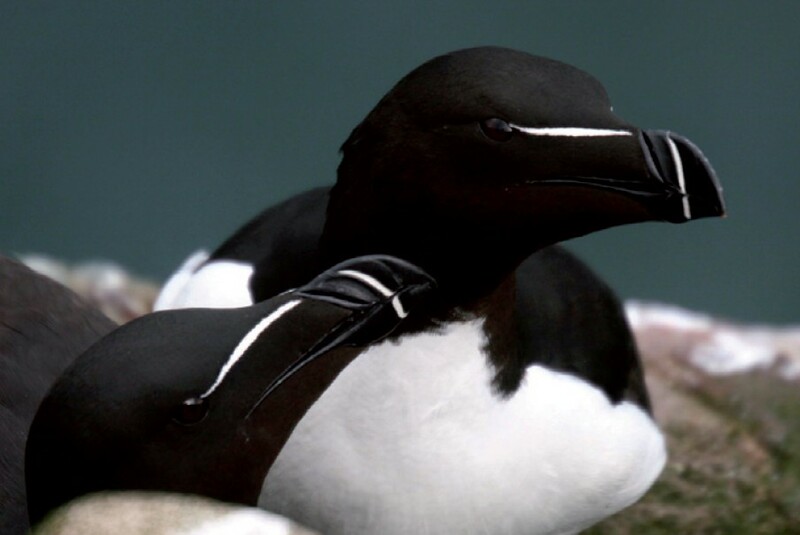 It is the least common breeding auk in Britain and Ireland, with a population of just under 43,000 individuals. 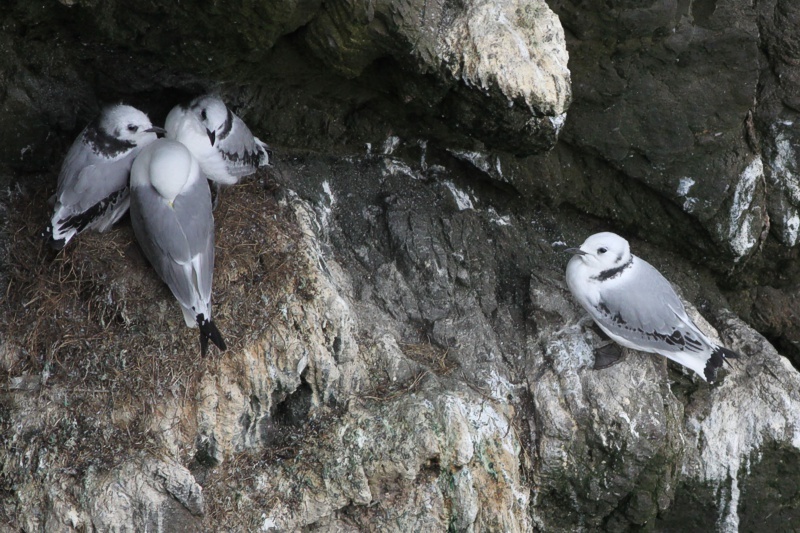 They nest in small caves, crevices and under boulders at the base of cliffs, and nearly 200 breeding-plumaged adults occur along Fair Isle's east coast where, in calm weather, they are easier to see. 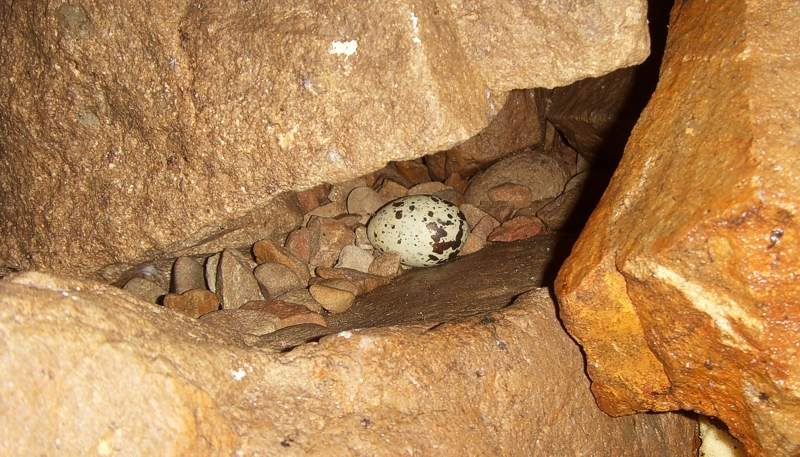 The clutch of one or two eggs is laid in late May with the chicks fledging from early August. Although sandeels are taken, the Black Guillemot differs from other auks in feeding largely on fish caught close to shore, such as the butterfish. The clear waters around Fair Isle offer great opportunities for admiring the velvety black plumage and bright red legs of these beautiful birds as they swim just offshore. 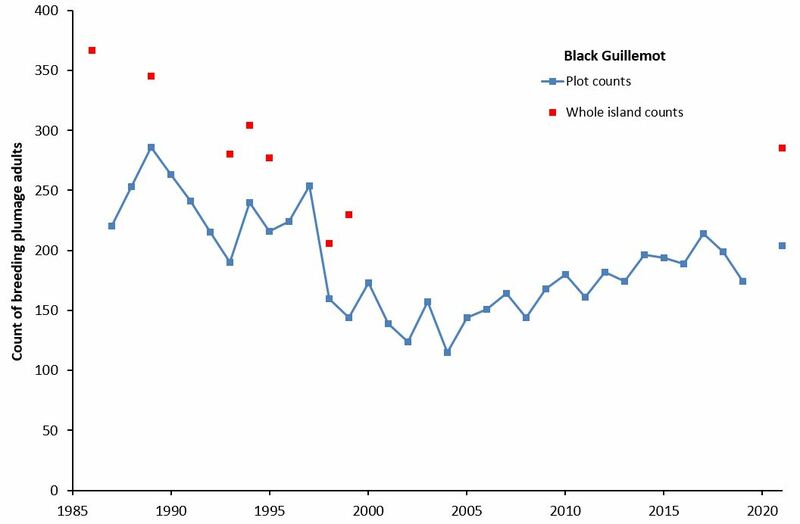 Whole island and plot counts of Black Guillemots on Fair Isle, 1986-2018. 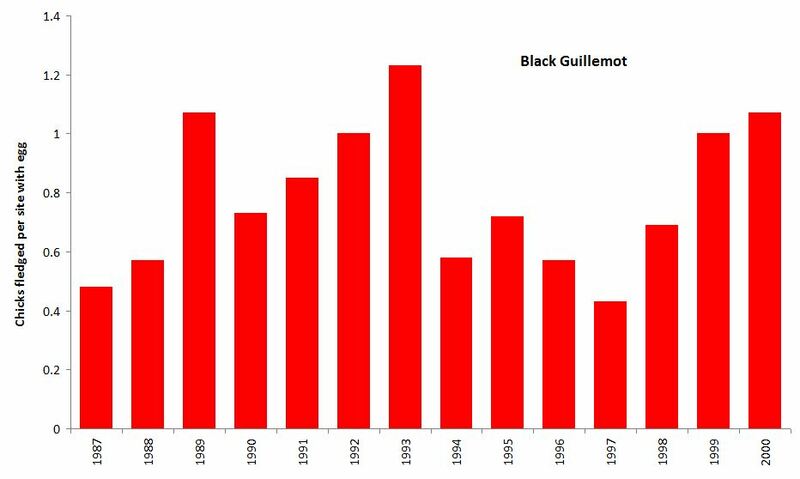 Breeding success of Black Guillemots on Fair Isle (east cliffs boulder beaches), 1987-2000. 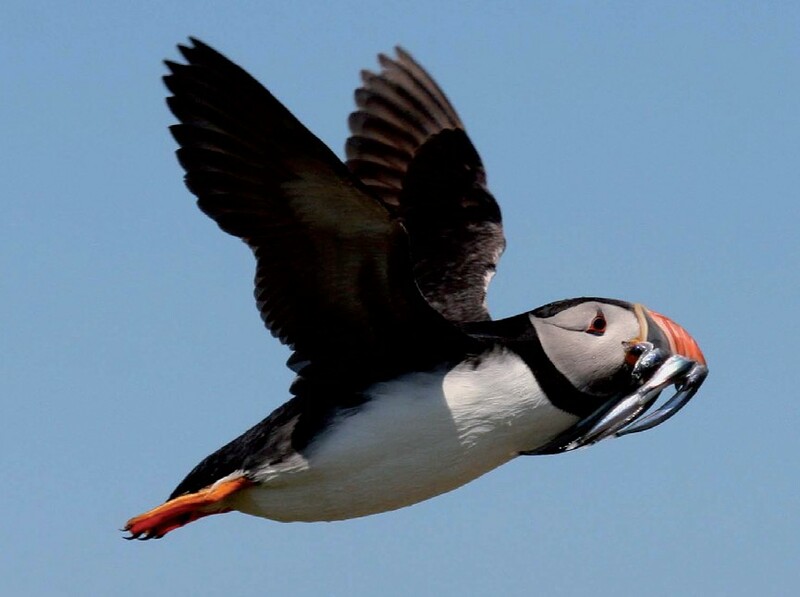 Puffins are found breeding throughout the North Atlantic, although small numbers do nest as far south as Spain. About 600,000 pairs nest in Britain and Ireland, the majority on offshore islands that are free of mammalian predators. This allows the birds to nest safely in burrows, which they can either excavate themselves or, as on Fair Isle, make use of old rabbit burrows. The first birds return to Fair Isle in late March and all have departed again by mid-August. The single egg, laid in late April, is incubated for around six weeks and the chick takes a similar time to fledge before heading out to sea to learn to fend for itself. Once the chicks fledge, they do not return to land for at least two years. Breeding success has generally been relatively high on Fair Isle, but despite this, numbers appear to have fallen dramatically in recent years. However, difficulties in surveying the Fair Isle population mean that the breeding figures should be treated with some caution. 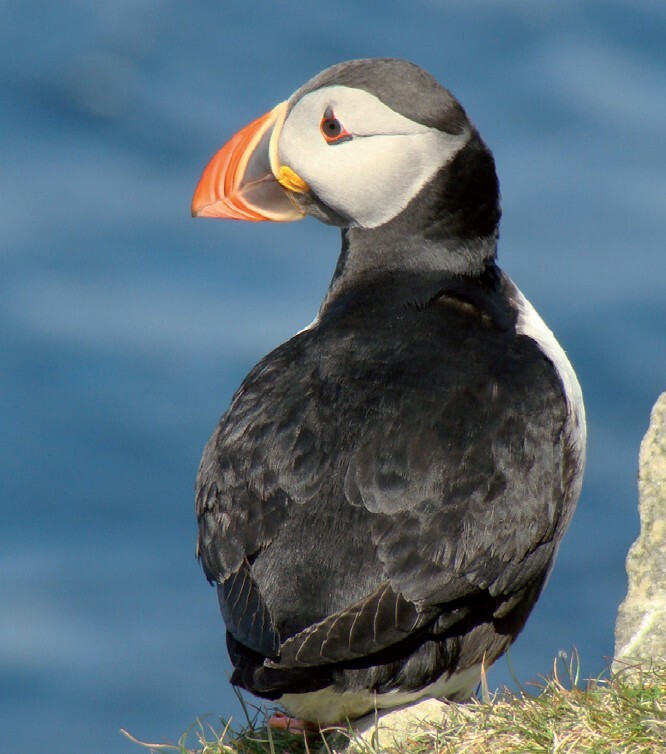 Luckily, Puffins are still very easy to see on the island during the summer, with some very approachable birds nesting just a few minutes walk from the Observatory. Keep an eye out for any birds sporting coloured leg rings, which are used to help study the survival rates of these charismatic birds. 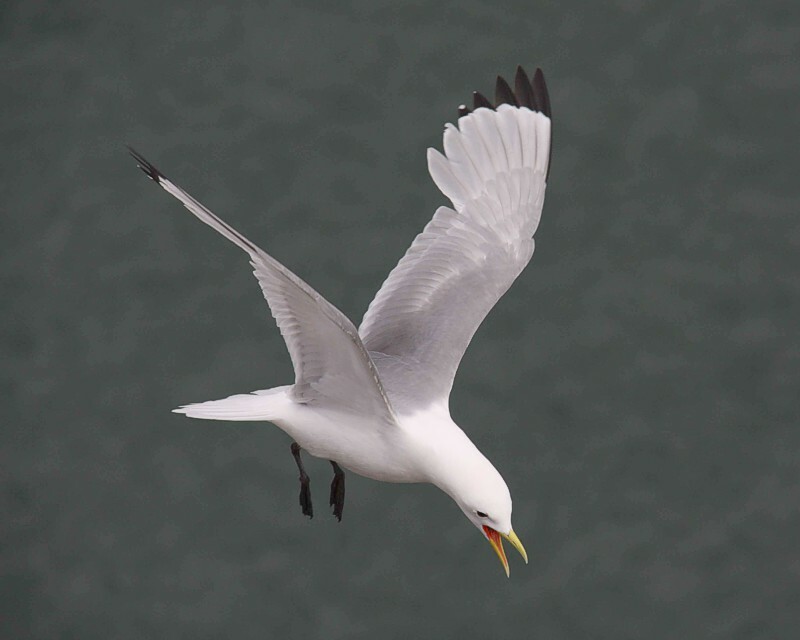 You may also see birds carrying a large number of small fish in their bills during the nesting season, the record for one bird being 83 in a single beak-full! 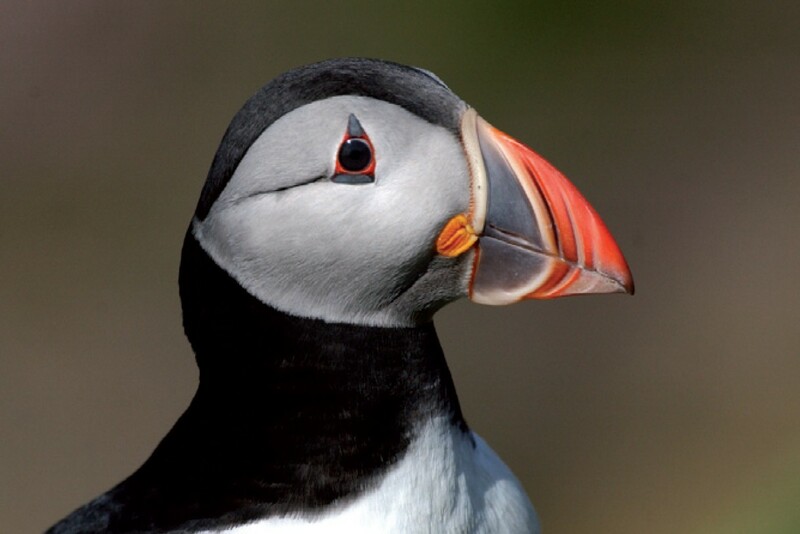 Many people are surprised by the small size of Puffins (they are about the size of a bag of sugar! ), especially considering the extreme conditions the birds experience – they spend most of the year in the open oceans. Their comical appearance belies a robust bird that can live to be over 40 years old. 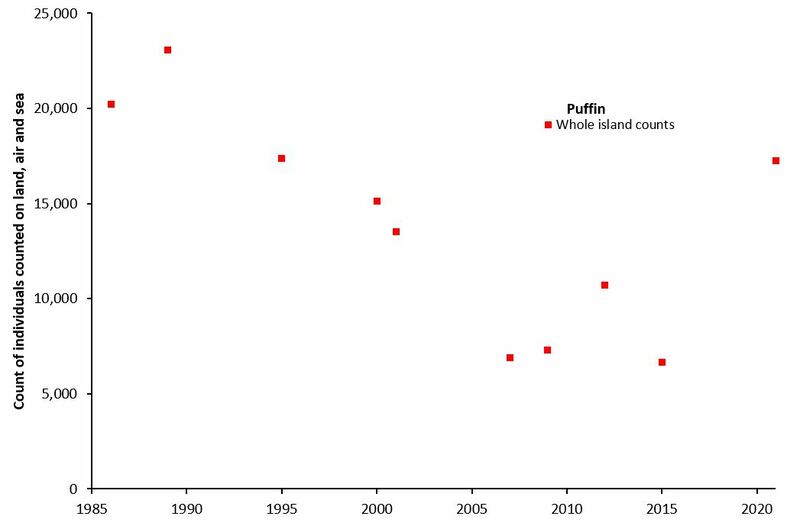 Whole island and plot counts of Puffins on Fair Isle, 1986-2018. 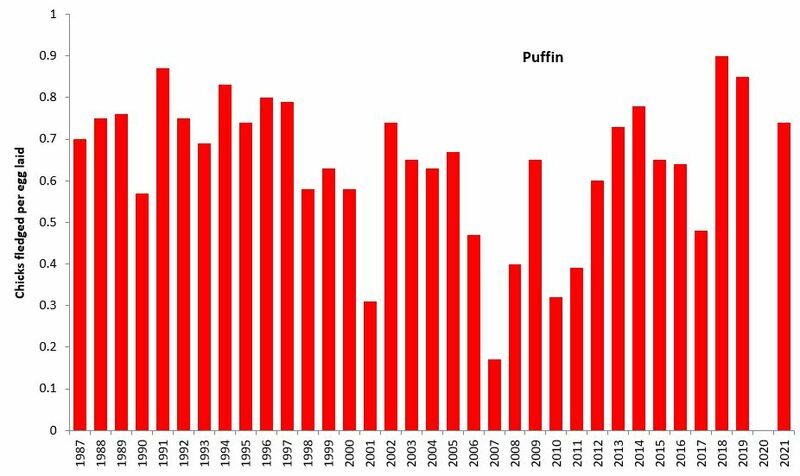 Breeding success of Puffins on Fair Isle (2 plots), 1987-2018. A summer visitor to northern Europe and North America, the Arctic Skua has a worldwide population of perhaps 350,000 pairs. 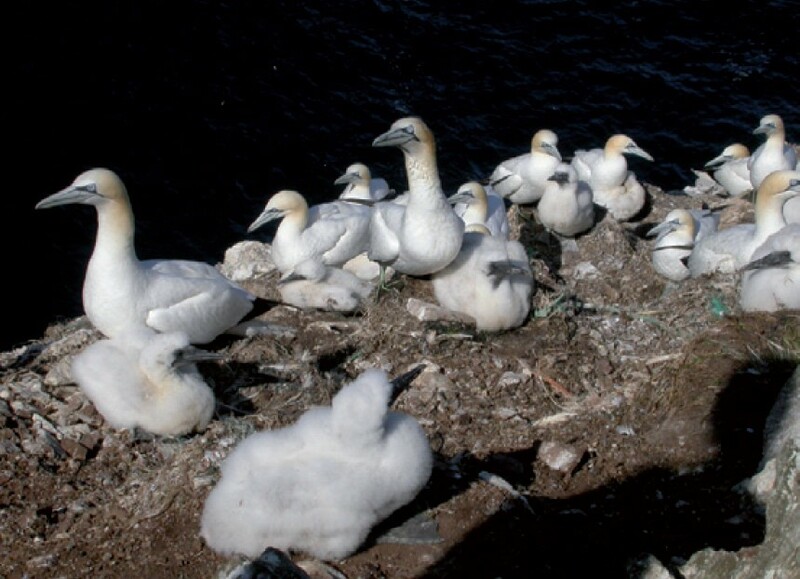 In the UK, most of the population (of around 2,000 pairs) occurs in the Northern Isles and the species has recently been elevated to the ‘Red List’ of conservation concern owing to recent population declines. Indeed, there are fears that the species could become extinct as a breeder in the UK. Birds usually arrive on Fair Isle in late April with only a few remaining after August. 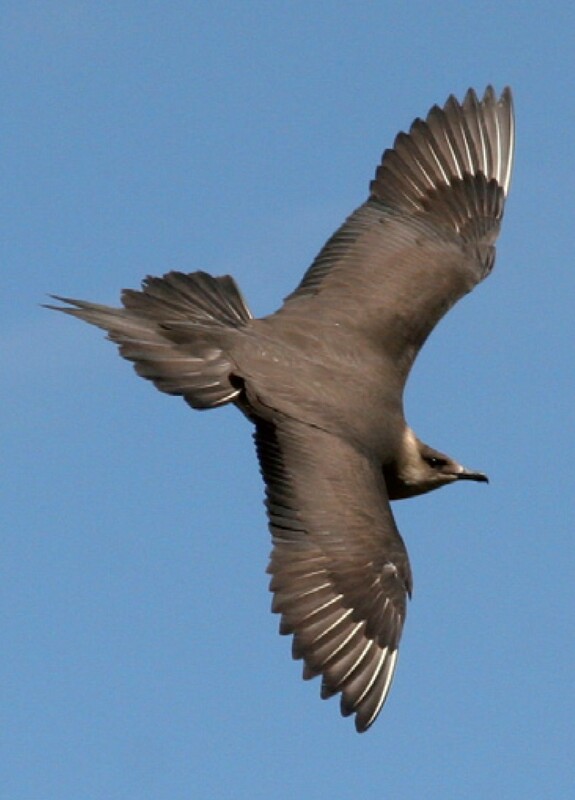 Arctic Skuas occur in two colour morphs, with one bird of each type appearing on the Fair Isle Bird Observatory logo. 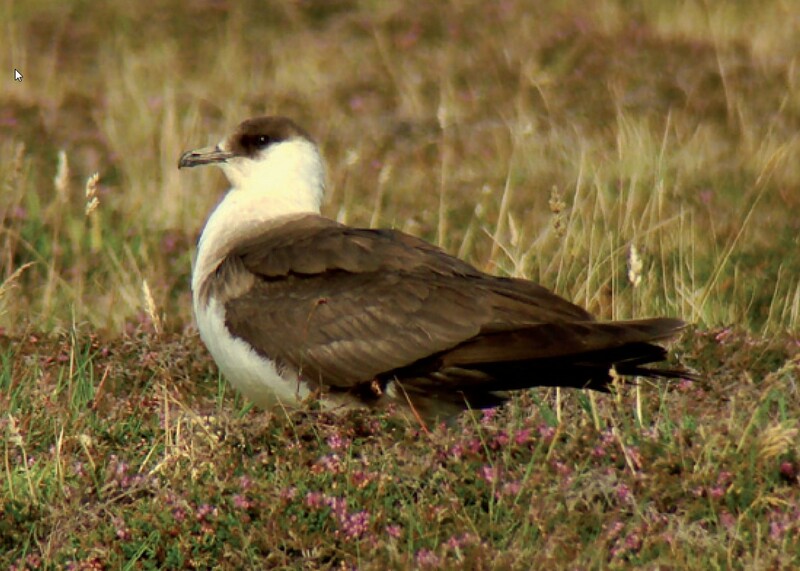 Although they will predate eggs and chicks of other species, the Arctic Skua relies mainly on kleptoparasitism (stealing food) in the breeding season. Consequently when food is scarce for birds such as terns and Kittiwakes, Arctic Skuas tend to suffer poor breeding seasons. 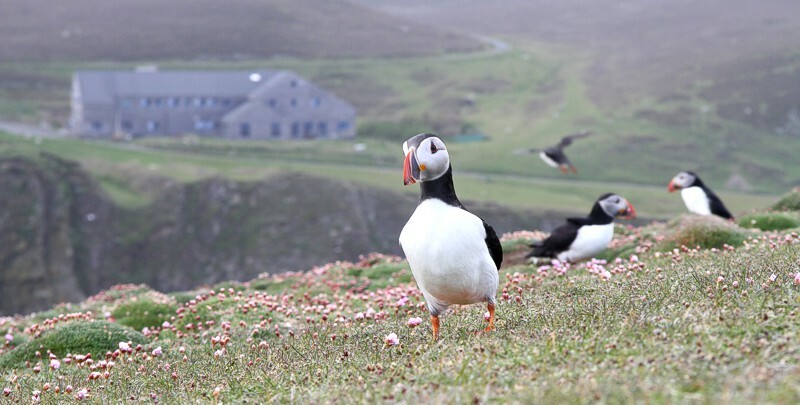 After reaching a peak of 180 pairs in the late 1960s, breeding numbers on Fair Isle have shown a steady decline in recent decades, to just 19 pairs in 2013. Breeding success has been very low, with just 29 chicks fledging in the 7 years 2007-13, many of which were then predated by Bonxies. More recently, a slight increase in numbers and an improvement breeding success in 2014-16 has regrettably not been maintained. 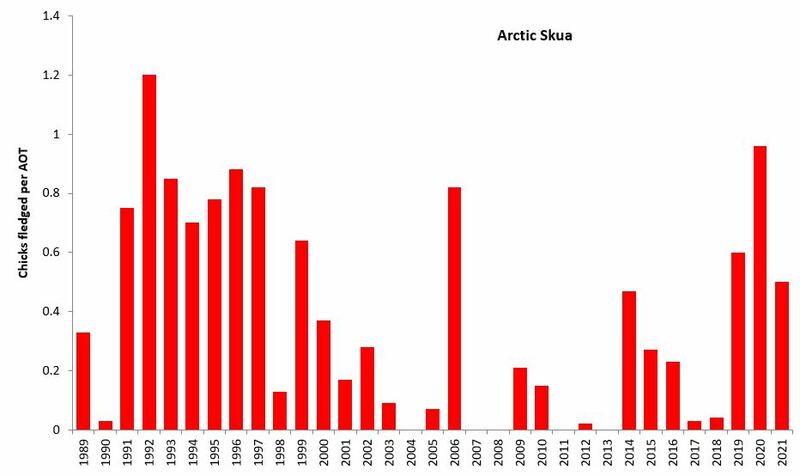 Whole island counts of Arctic Skuas on Fair Isle, 1965-2018. 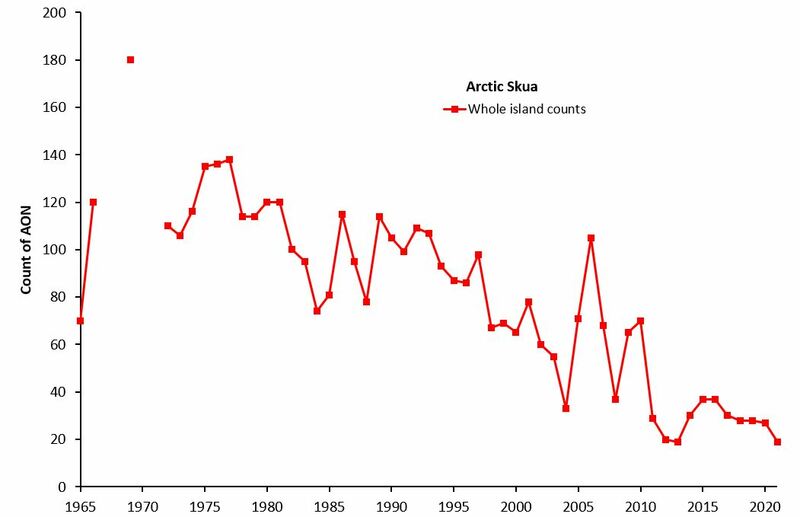 Breeding success of Arctic Skuas on Fair Isle (whole island), 1989-2018. Note that in some years, no young have fledged from the monitoring plots. 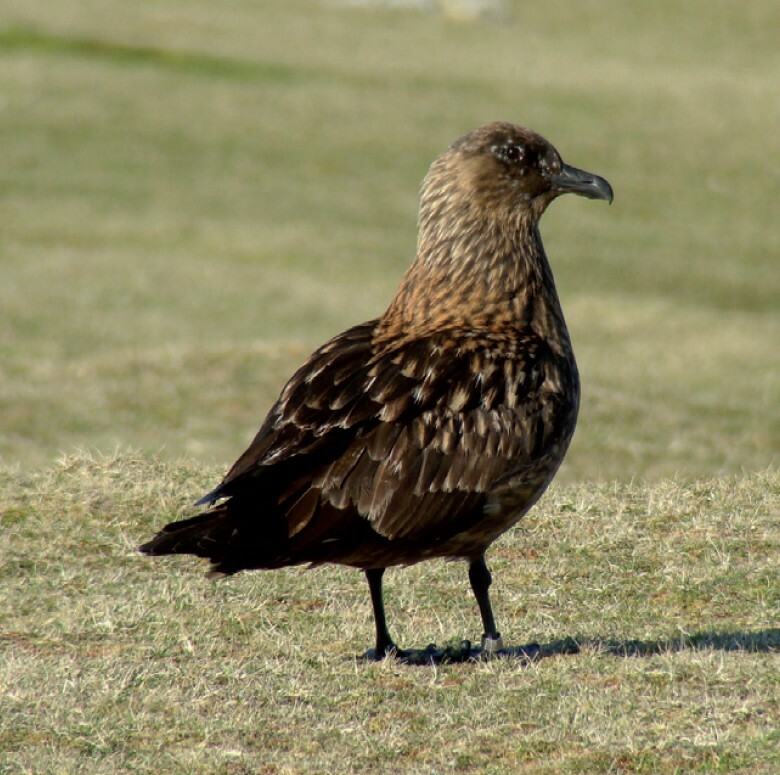 The Bonxie has a very limited distribution, with a population of around 16,000 pairs restricted to the Faeroe Islands, Iceland, Norway and Scotland. Almost all of the Scottish population of around 9,600 pairs occurs in the Northern Isles. They winter at sea, mostly in southern Europe but some move as far as South America. Bonxies are long-lived, the oldest recorded being over 36 years old, but most don’t breed until around their seventh year. 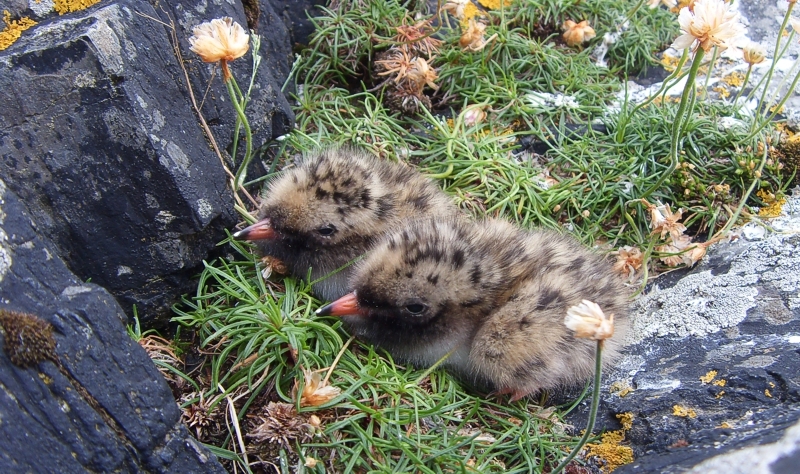 The first birds usually return to Fair Isle in late March, laying a clutch of two eggs in late May and the chicks fledge around three months later. 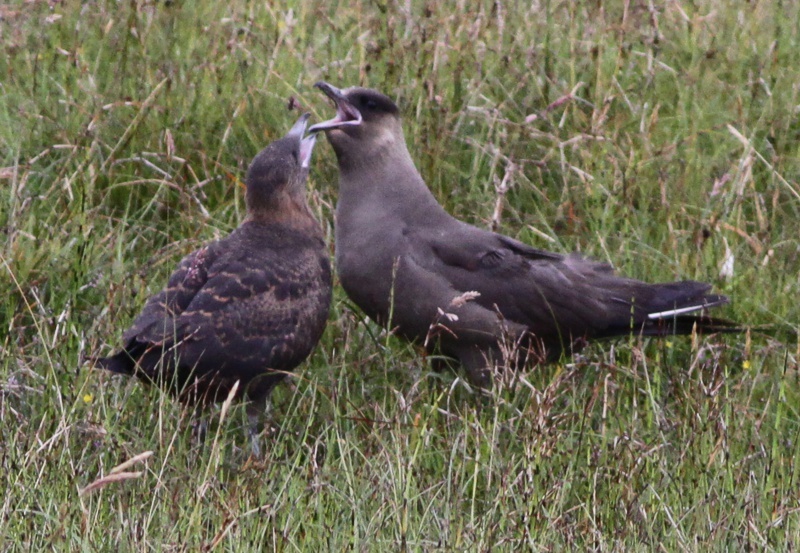 Bonxies are very aggressive on their breeding grounds and will swoop at anyone getting too close to their eggs or chicks; that’s 1.5 kg of angry skua with a wingspan of almost 1.5 metres coming at your head at speed if you should stray into a breeding area on a summer visit to Fair Isle! Breeding numbers on Fair Isle have increased since recolonisation in the 1920s, with 520 pairs present by 2018, although at least some of this increase may be due to birds relocating from elsewhere in Shetland. 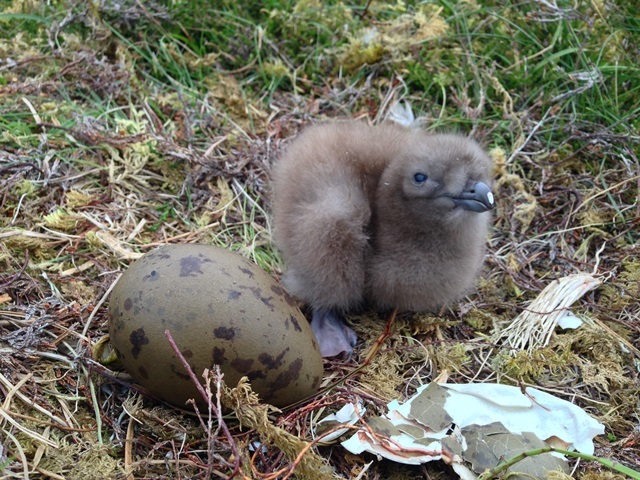 The Bonxie has a varied diet, including fish (often stolen from other birds or taken from trawler discards), carrion and other seabirds, but breeding productivity in recent years has nevertheless been generally poor. 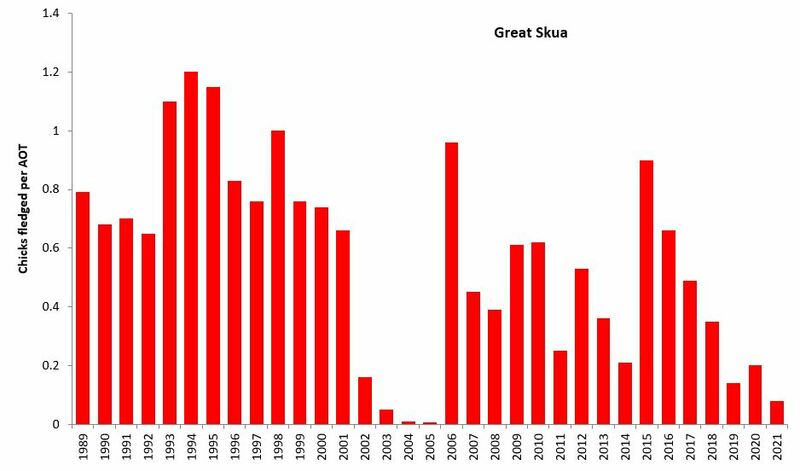 Whole island counts of Great Skuas on Fair Isle, 1965-2018. 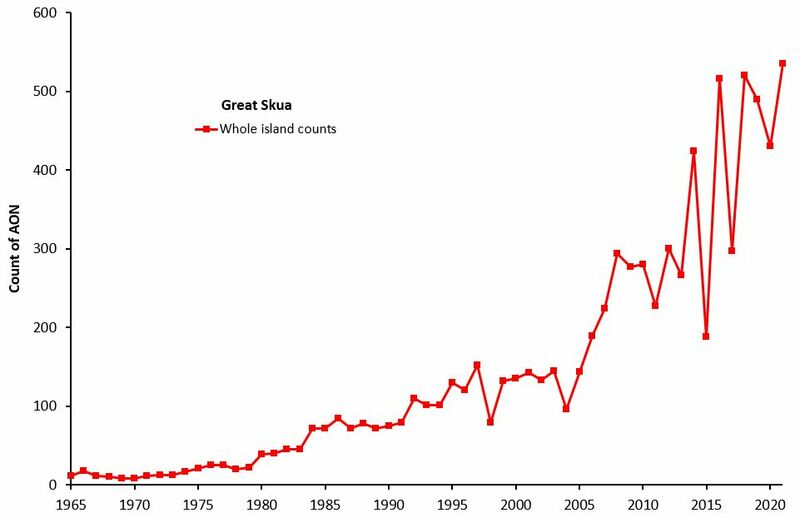 Breeding success of Great Skuas on Fair Isle (whole island), 1989-2018. This delicate gull has an almost entirely coastal distribution and can be found throughout much of the northern Pacific and Atlantic Oceans. The British population is around 415,000 pairs but has declined greatly in recent years. 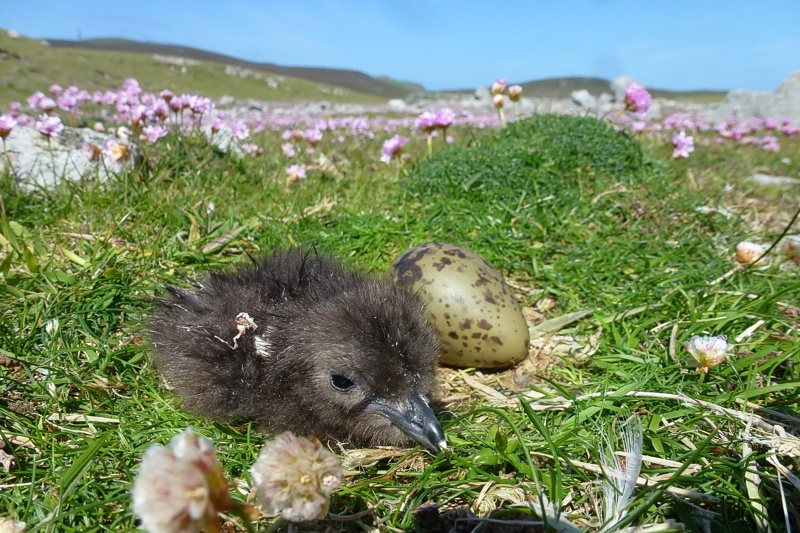 In Shetland, a combination of a lack of food (the species feeds mainly on small fish) in the breeding season and predation (especially of eggs and chicks) has seen some colonies disappear altogether. On Fair Isle it is a similar picture, with a decline from the peak count of 19,340 pairs in 1988 to only 771 pairs in 2013. 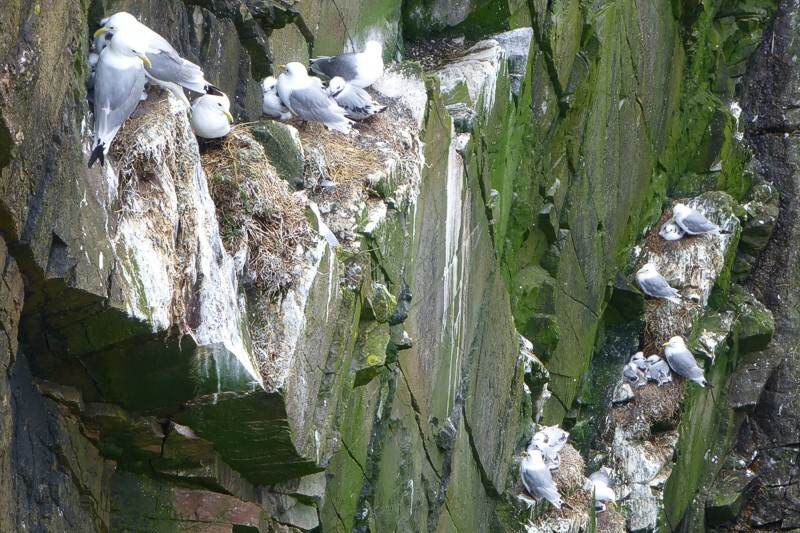 With productivity in 2003-13 being consistently low (including some years with no chicks at all surviving), the future for Kittiwakes on Fair Isle looks bleak. Productivity in the last few years has been better, offering some hope for the future. Some interesting recent research has suggested that British birds that have failed in a breeding attempt tend to depart early and head 3,000 km across the Atlantic to winter, whereas successful birds tend to stay much closer to their colonies. 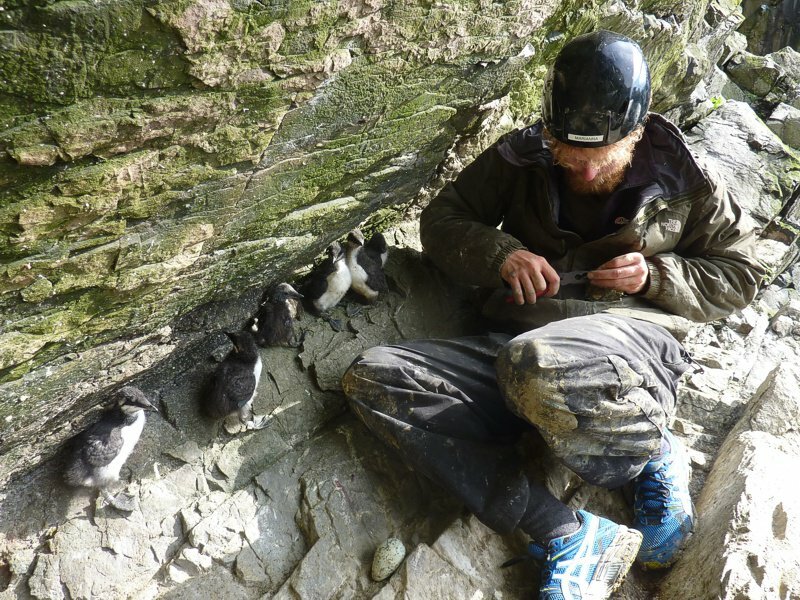 This sort of research shows that there is much still to be learned about our seabirds away from their nesting areas. 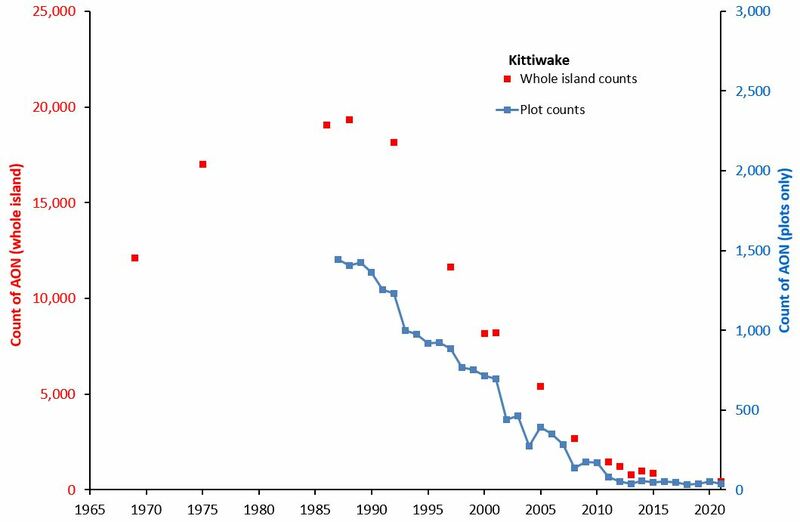 Whole island and plot counts of Kittiwakes on Fair Isle, 1969-2018. 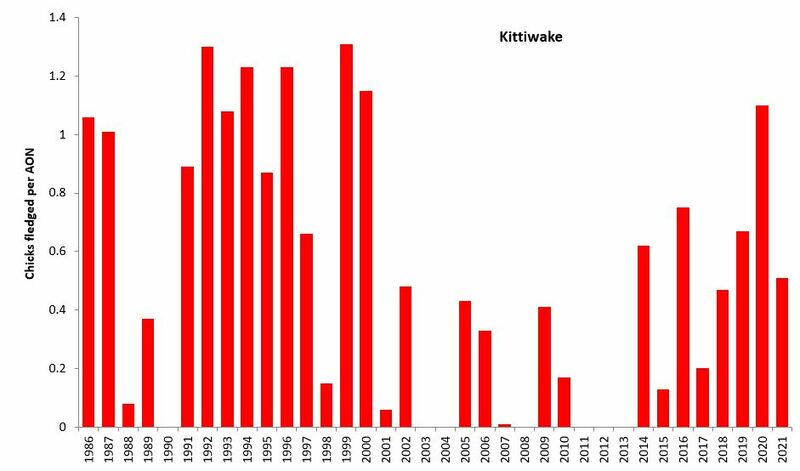 Breeding success of Kittiwakes on Fair Isle (means of 10 plots), 1986-2018. The Arctic Tern breeds in arctic, subarctic and north temperate coastal regions, with around 56,000 pairs nesting in Britain and Ireland. They undertake one of the longest migrations of any bird in the world, covering around 20,000 miles every year on their flight to and from Antarctic waters. 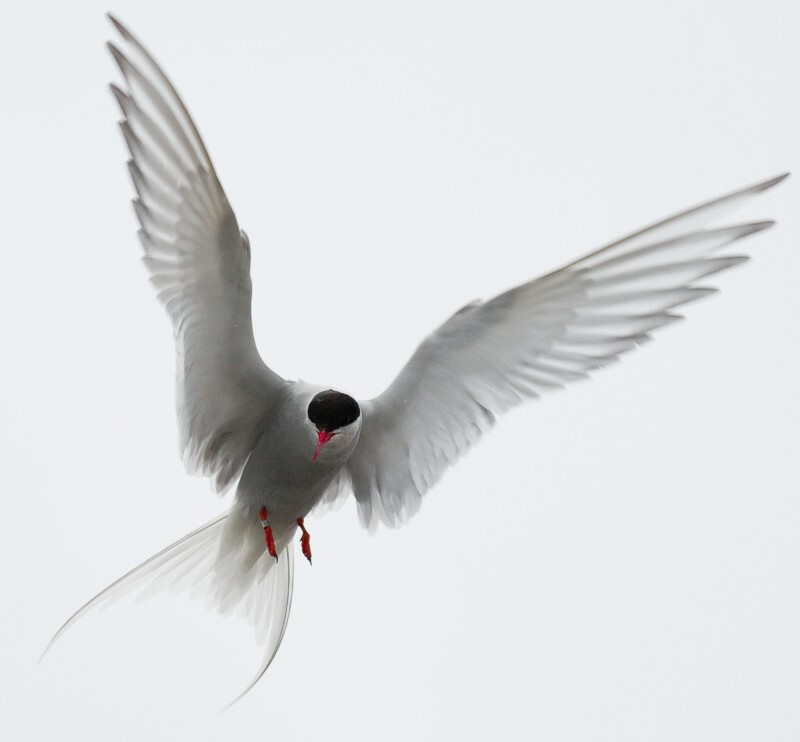 Arctic Terns live to around 30 years of age, so in that time they can travel a lot of miles! The Arctic Tern was first recorded breeding on Fair Isle in the 1980s, although they may also have done so in the early nineteenth century. Numbers have fluctuated considerably since then, with an impressive 2,836 pairs nesting in 2001, but only 115 the following year and none at all in 2008. Productivity also varies wildly, with no chicks produced at all in some years, usually due to a lack of food causing youngsters to starve. Predation from gulls, skuas and feral and domestic cats is also a major issue. The food required is small fish, such as sandeels, which are usually caught close to shore. Despite weighing only just over 100 grams, Arctic Terns can deliver a painful peck when defending their nest sites, so it is best not to approach the Fair Isle colonies too closely. 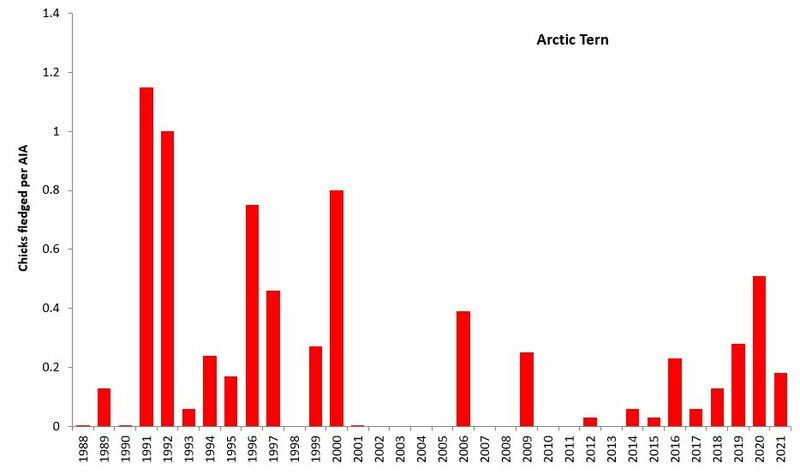 Whole island counts of Arctic Terns on Fair Isle, 1965-2018. 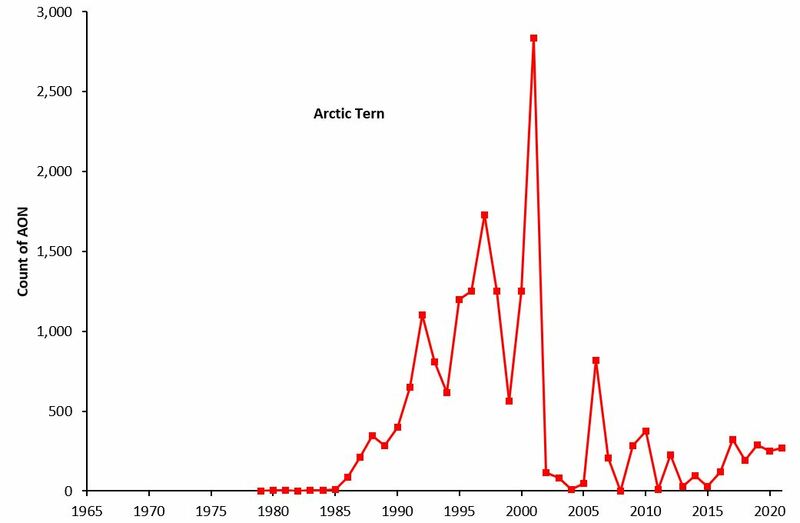 Breeding success of Arctic Terns on Fair Isle (whole island), 1988-2018. The Common Tern is a long-distance migrant that breeds across much of western and central Europe but winters in western and southern Africa. 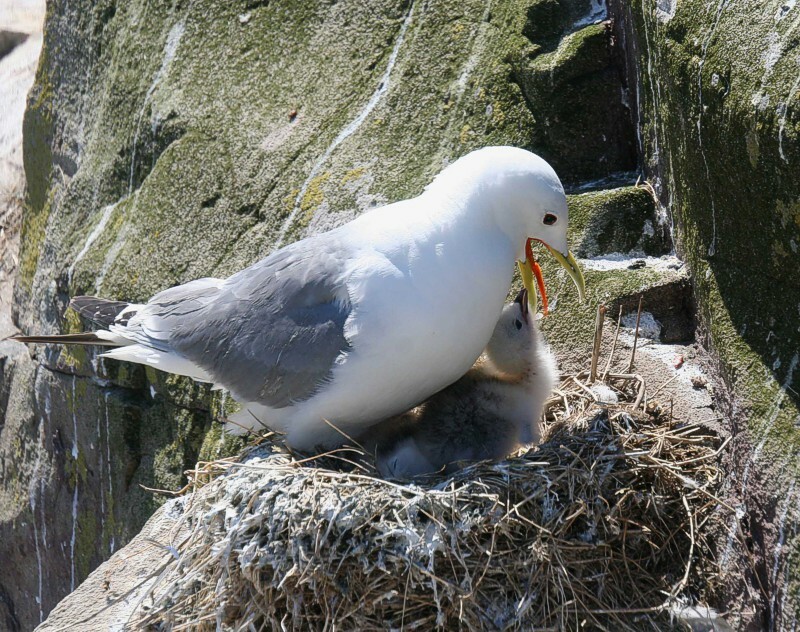 In the UK, there are around 14,500 breeding pairs in total and nesting occurs both at coastal and inland locations (data from Seabird 2000). Common Terns were first recorded breeding on Fair Isle in the late 1960s, although it is possible that a few pairs bred successfully before this time. In recent years, very few pairs have settled to breed on the island; however, this was not always so, and in the late 1970s and 1980s there were up to 60 pairs nesting. The reason for the recent decline in numbers, down to zero pairs in some years, remains unclear, but lack of small prey fish in Shetland waters around the time of breeding, plus direct predation of chicks by cats, skuas and gulls on Fair Isle, are likely causes. 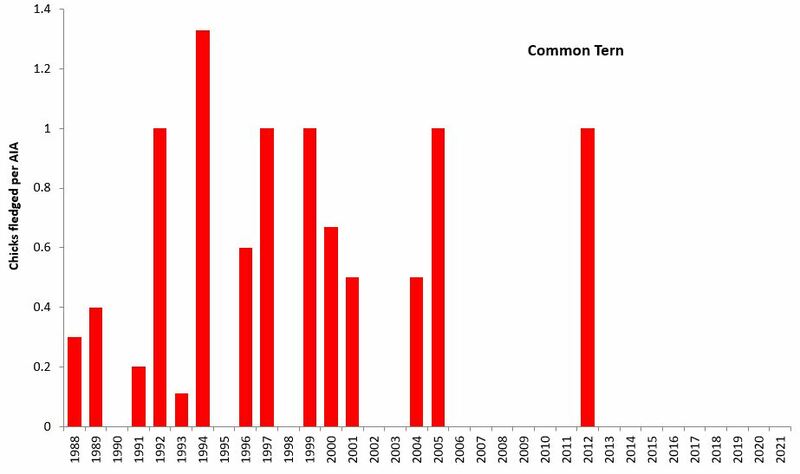 The breeding success of Common Terns has been very variable since 1988, but was highest in the 1990s. Back then, food for the chicks - notably Sandeels - was more abundant in the seas around Fair Isle, whereas now good years for Sandeels are relatively scarce. Common Terns do not always nest at the same island sites every year, and it is possible that if fish stocks improve around Fair Isle breeding numbers might start to rise, due to immigration of pairs from elsewhere. 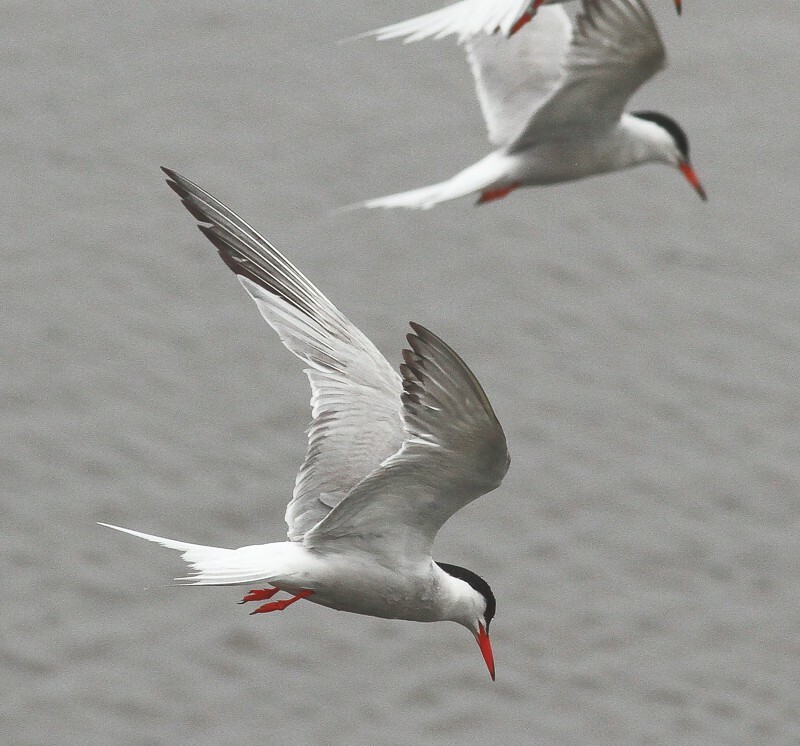 When Common Terns breed on Fair Isle they often nest within Arctic Tern colonies, and can be spotted due to their long, orange-red bill with a black tip, which is unlike the slightly shorter, all-red bill of the Arctics. 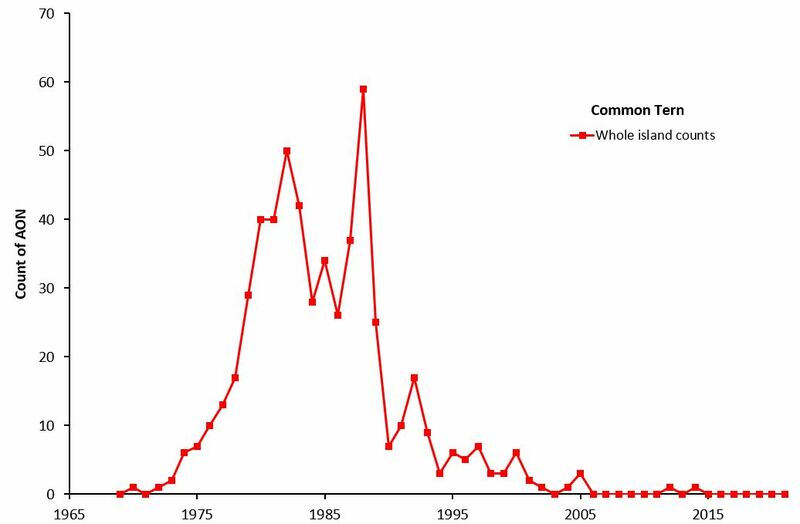 Whole island counts of Common Terns on Fair Isle, 1965-2018. 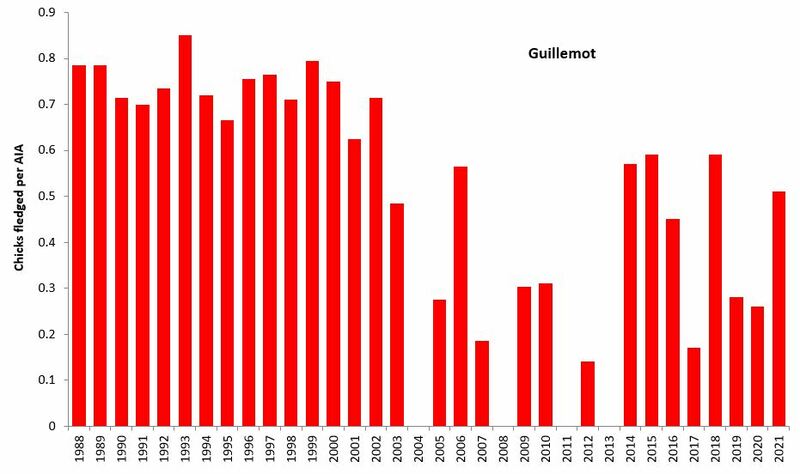 Breeding success of Common Terns on Fair Isle (whole island), 1988-2018. Common, Herring and Lesser Black-backed Gulls together with Eider also nest in small numbers on Fair Isle. This webpage is based on a poster compiled by Dr P.G.H. 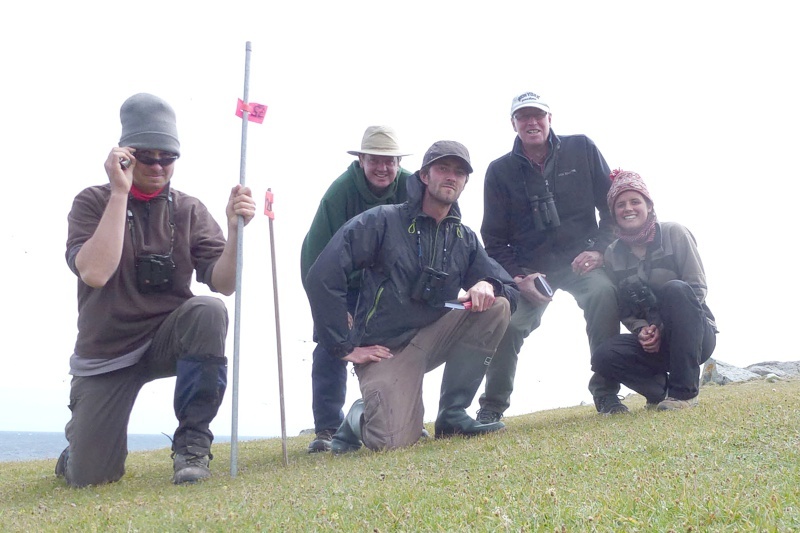 Evans, Eric Meek, David Parnaby, Dr Roger Riddington and Deryk Shaw in 2011 and additional material (Leach's Petrel and Common Tern) by Will Miles in 2015. Fair Isle Bird Observatory is most grateful to the Joint Nature Conservation Committee, which has supported the seabird work on Fair Isle since 1986 as part of its Seabird Monitoring Programme. 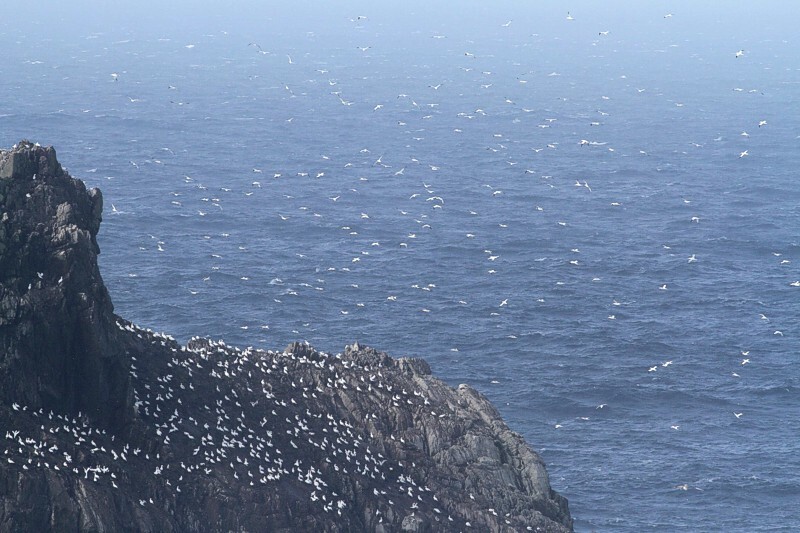 Fair Isle Bird Observatory’s long run of seabird monitoring data going back to 1969 is available to view at the JNCC website.